I just came across this video, which seems to be a loose response to the “I am Tibetan” videos that have come out of Tibet and in the diaspora to encourage the Tibetan identity. This guy (who pronounces all the Tibetan names wrong) is clearly Chinese (his name is Vinnie Hu), declares “I am a Tibetan Mastiff” to represent himself as a Tibetan who is metaphorically a Mastiff. This trope always comes with its opposite default, the Barbaric Savage or just Savage. During the 2008 uprising, angry Chinese netizens called Tibetans, ungrateful barbaric savages who did not appreciate the modernization/civilization brought to Tibet by China. In other words, Tibetans don’t know whats good for them. 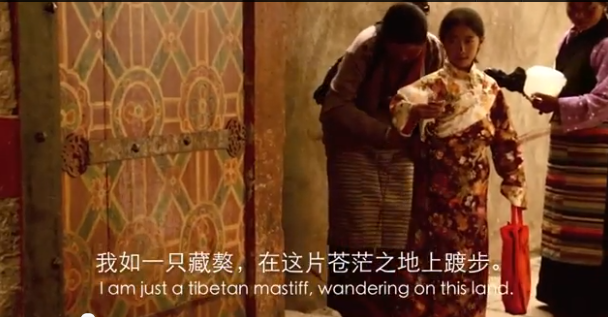 This video encourages the stereotypes most mainland Chinese have for the Tibetans. In 2008, it was the Barbaric Tibetans, Vinnie Hu’s video depicts the Tibetans as the Nobel savage. Hu goes a step further, he pretends he IS Tibetan (a dog, nonetheless) and, therefore, Chinese. Native communities have traditionally encountered these two bipolar tropes that subject them to the two sides of the same coin. Noble or Barbaric, both are considered backwards savage. The Tibetans, for Hu, represent the magnificent Mastiff, majestic, but almost, non-human. I think there is another way of looking at the vedio; The vedio maker, Vinnie Hu, has made it clear that he made the vedio on his own, “one man’s Tibet”, he has not attempted to pass himself as a Tibetan. I think this is a pro Tibet & pro Buddhist vedio from the start by the Budhist quote he uses and last quote. I feel the writer of this blogg failed the first request, “you need to throw away your opinions and speculations”, and speculated on the Vinne saying, “I am a Tibetan Mastiff”, in this story the “I” is “Vinnie Hu”. Therefore I don’t think he is saying Tibetans are like Tibetan Mastiff. 2) He shows Tibetans as peaceful, religious and happy people, “without anger and resentment”. But, He says, “I can still smell blood, thats from last 50 years, China’s and Chinese blood.” To me thats refering to the Chinese occupation of Tibet and blood they spilled. Then the answer; he shows Tibetan building with Chinese flag (symbol of conquest), China’s claim of development, and free education, yet the Tibetans in the picture are poor, there are not in schools, they speak Chinese (not Tibetan or any other language)? The developments are all long long away, using long distance shots. Then the music changes to simpler life, of beautiful scenary etc, as if to ask the viewers to choose the vision of the Chinese Communist party and the “Lama’s vision”? 3) The Question, “will the human really face their own conscience” he shows the Chinese flag on roof, to me he is asking will the Chinese realy, “pick up their attitudes towards Tibet”. Answer, he doesn’t know if the Chinese will, but he asks all Tibetans to rise to the challenge (he shows the car struck in ditch, while very mobile horse riders), Just before the end, he says, “what the hell, I am willing to die for this land.” That is not someone who hates Tibet? Therefore, I will like to ask the writer to relook at the movie, sometimes there are Chinese supporters, we must not get suspicious of all or we will never be able to have a good dialogue and alienate ourselves. My point was not to shed light on the Chinese “supporters” themselves, but to interrogate their “intention” what does this form of “support” really say about their views on Tibetans. Hu may have been trying to show support for the Tibetan people, but I am questioning his “view” of the Tibetans, as “noble savages.” Humble, uncivilized and compassionate people who need help from the Chinese who bring them “civilization/modernization”. I find that view, even if intended to show support, still condescending and racist. Yes, Dawa la, “intention” or motivation is very important, but what is his “view” of the Tibetans, we are both speculating. I am trying to do it from the pictures and what he said. I know from his one piece of movie it is not enough to draw a conclusion on his views and intentions, but I feel I have looked at his overall movie, while you have picked on one part (“I am a Tibetan Mastiff”), also above you have only picked on my last paragraph and my arguments? Anyway Tenzin Takla, is going to ask Vinnie Hu, if she can. We will see what he says..
Sonam La, you are right, you and I are both engaging in speculations about his views and I’ll be excited to know what you hear. I do, however, find it important that he called himself a “Tibetan” and a “Mastiff”, Tibetan Mastiff. Yes, its one aspect of his video but those are his words nonetheless. And Mastiffs are, in a realistic sense, “loyal” dogs. Remember good intentions may be from the heart, but they don’t always mean good results for the natives. Native land and Culture were attacked and taken by good intentioned men (men of God?) from the modern/civilized world. Sonam Dugdak – I kinda get what you’re saying as the clip seemed to have mixed inferences. Some of it e.g. the “Lama’s inferences” were positive.. but what about the throw-ins e.g. “… the fickleness of the lamaseries…”? … the theme of embracing the new times (suggesting being one with China) …. I dunno dude!! mixed messages for me.. I saw this documentary on the Sina. It reminded me of a Chinese propaganda against the “Dalai clique of long-term relations and distorted in a foreign country propaganda” discussion few years ago. The Chinese doctor said: “propaganda material for foreigners” would have to think about Western ways of thinking and language, into their discourse system. We had to say, “So it is with this documentary, is a” foreign propaganda “, packed with all sorts of Chinese Communist propaganda, but changed the packaging, the so-called” personal “way. In the aftermath of the “Tibetan Incident” in March this year, one of the most significant changes has been the relationship between the Han and Tibetan ethnic groups, in other words the question of the status of Tibetans in China. It can be said that relations between Hans – who make up the majority of Chinese society – and Tibetans have never been so clearly revealed than after the “Tibetan Incident” last March. In the past, it was as though a veil separated the two and this not only made thing unclear but also produced a very beautiful effect similar to looking at a flower through the fog. Moreover, many Tibetans used to sing their own praises and believed that amongst the 55 minorities in China, their status was the highest, their minority was the one most likeable to the Han people, and they in particular meant much more to Chinese people than Uighur people. Tibetan reincarnated lamas and Tibetan monks, for instance, often come and go between Tibetan and Han areas, have numerous Han disciples and feel proud to serve as Hans’ Lamas. However, among the Chinese people there are many so-called “Tibet fans” and some of them call themselves “drifters in Tibet”. Hardly have they spent a few years in Tibet that they find life has no taste. In 2006 when the train entered Lhasa, it seemed that the whole of China started feeling excited about the Qinghai-Tibetan Plateau, and nearly everyone wanted to climb to the Potala. It can be said that it has been a very long time since Hans and Tibetans, I mean the relationship between the common people of the two people, have been permeated by tender feelings that cannot endure the truth. And after the events in Tibet last March, this veil was lifted. It turns out what many of the Tibetans are satisfied with is just their status of finding favour with the Han among the fifty-five ethnic minorities. Many Han people, be it their love for Tibetans before the events or their hate for Tibetans after the events, have clearly shown that the feelings they nurtured were similar to the feelings of an owner towards its pet. This can be compared to the Tibetan mastiff, the most famous animal living on the Qinghai-Tibetan Plateau. It seems so rare and so valuable that some Chinese tycoons or those who pose as lovers of culture spend vast amounts of money in a rivalry to purchase the mastiff which they also have to feed with lots of meat every day. But one day, the Tibetan mastiff all of a sudden gets angry and bites the person who has become its owner, and the animal is beaten to death on the spot. Chinese newspapers often relate this kind of story. And it perfectly illustrates the relationship between Tibetans and Chinese. This is actually the real and fundamental relations between ethnic groups in Chinese society. If Tibetans are content with being pets, the Han people will maintain the tender feelings they once had towards Tibetans; and just like they are willing to feed cats or dog they like, those Hans will keep on “loving” Tibet. But human beings are not pets: pets do not have a volition of ego, whereas human beings do. Tibetans do not want to be pets, for the consequence of being a pet involves the loss of self, and ultimately the loss of Tibet. Therefore, as long as Tibetans are not content with being pets, or not content with accepting their fate of being pets, and bravely fight for the their being human beings and being Tibetans, then this is what brings trouble. In fact, trouble is already there; Tibetans are sometimes arrested, detained, tortured or even massacred. These are punishments inflicted by the country’s regime. To the Han people who evolve in the non-government sphere, the fact that some Han people changed sides so quickly allowed the truth to surface. And the truth is that Tibetans cannot act as humans. As soon as they do, they are exposed to fatal risks. Actually, Uighur people obtained the same kind of result a long time ago. The bottom line is that Tibetans and Uighurs are the same: they have not been able to secure a status equal to the Hans in a Chinese society mostly made up of Hans. And this is what was revealed through the events that unfolded last March in Tibet. For many simple-minded and easily satisfied Tibetans, this was like a hit in the face or from another angle, a very significant lesson. The U.S. would stop doing business with China if it was a riotehgus nation truly devoted to promoting the existence of democracy and freedom in all nations. However,it is anything but so we continue to do business with a country that treats its citizens and those who no longer want to be citizens horribly. China is not only an embarrassment to itself but an embarrassment to every free and democratic nation that insists on associating with it. If the nations of the world had any decency at all,they would force the Olympics to held somewhere other than a country like China. Word. Thank you very much for the kind efforts and time to find this article. If he has read Woeser la’s articles and it is his attempt at propaganda aimed at the west, then that is very interesting. And the best things to do with propaganda is to twist them for our benefit. Professor Robbie Barnett did a talk once on use of Buddhist rituals in propaganda movies, there was one movie which shows ungrateful Tibetan lamas cutting up and throwing PLA soldiers and cadres into Gutro (དགུ་གཏོར) fire as lue. Tibetans thought it was wonderful idea and were encouraged by these symbolism of banishing the PLA and cadres, unlike the propaganda’s intention of showing these lamas as ungrateful, evil and power hunger. Therefore sometimes propaganda like jokes, if you can play along and then throw something back at them, you can get the upper hand, rather then getting upset about it. i.e. I think if he is calling us a Tibetan Mastiff, or noble savage, I think it is good to acknowledge the virtues of Tibetan Mastiff, but say back are you a pekingese or peke, a domesticate toy dog ? Anyway you have more to look forward to http://www.chinesefilms.cn/1/2011/06/01/101s3300.htm, this movie is coming out next year. I think guy might have been doing research for it? For me, based on the visuals and the english narration, there is no doubting, that the video is aimed at those in “the West” and perhaps the younger generation of Chinese youth. I agree with Woeser la, that there is propaganda here… some of it more obvious e.g. the questions asked to the Tibetan children/youth in the clip e.g. “Do you love your country (China)?” “Do you like learning Chinese?”, the statements about how China brought free education and the establishment of the railway etc. I also agree that “Tibet” harbours mixed feelings for the Chinese, much like the article Woeser la illustrates. The guy making this “movie” seems to be a student, seemingly mainland born, but studying in the US now. He seems to be a Buddhist. There is a possibility that he has heard Kundun speak about the Middle Path; there is a possibility that he is trying to answer his own confusion about Tibet; the same confusion that many other Chinese (students or otherwise) outside the mainland may have following 2008. Whatever the intention, I wonder if he is aware that the mere fact that he is Han Chinese will create a bias in the answers he gets to the biased questions he may pose (whether intentional or not). To date, he has accepted my friend request on facebook but I await a reply to a message inviting him to have his say. The stereotype of the noble savage can be interpreted in a different manner, at least in America concerning the Native Americans, First Peoples, etc. Here, the stereotype of a noble savage is indeed seen as one who is somewhat “ignorant and simple-minded but simultaneously uncorrupted by any of the moral failings of modern civilization and possessing an innate wisdom and connection to nature”. However, that innate wisdom and connection to nature seems to trump ignorance and negate simplemindedness. As one who has admittedly bought into this myth in my less educated youth, the “noble savage” acts as an antithesis to the unfulfilling consumer culture that is so prevalent in America. Here, many yearn to be reconnected with the natural world, to be delivered to a culture that does not revolve around money. But I don’t think we know how. Without a direct way to achieve this, and with significant cultural opposition, the noble savage stereotype comes into play as a focal point. Obviously this stereotype is incorrect and a way for Americans to compartmentalize unfamiliar aspects of the world. This phenomenon seems to have been transferred to the interactions between many westerners and indigenous populations, it can be seen in the format of certain third world documentary photographs and what many travelers hope to find and photograph when traveling to areas with indigenous populations. This stereotype plays a role in why the Tibetan movement is so visually appealing to American supporters, the image of the Tibetan nomad in traditional dress reminds us of historical stereotypes that tug at our heartstrings.